Redmond & Associates is the small consulting company I lead. In fact, most of the time it’s just me. Although I have helped some very large companies with their IT strategy (mostly in the transition to the cloud), I spend most of my time these days working with small software companies as a strategic adviser. The kind of topics I work on are new product development, strategic restructuring, and facing the challenge of having to develop compelling products that are competitive within the fast-moving Office 365 ecosystem. Apart from that, I write a twice-weekly blog called “Exchange Unwashed” on WindowsITPro.com, where I cover topics relating to on-premises Exchange, Office 365, and anything associated with these technologies. 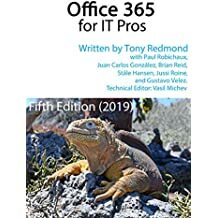 And of course, I am busily exploring the boundaries of eBook publishing with efforts such as “Office 365 for Exchange Professionals“, which can be a full-time job at times, especially when the team is driving to complete a new version. Clearly there’s a limit to what one person can do, so when I need help I reach out to my wide network of contacts. Most of the time I work with other members of the Microsoft Most Valuable Professional (MVP) community, where my “associates” (hence the name) specialize in disciplines such as Exchange, Office 365, Skype for Business, and Directory Services. I’ve worked with some of the best in their fields, which is always nice to be able to say. If you want to get in contact, send email (naturally) to 12Knocksinna AT Gmail.com. Yes, it’s a Gmail address – if I respond, it’ll come from my Office 365 account. And you can always follow me on Twitter @12Knocksinna to get updates about blogs, articles, and other activities that I’m involved with. It’s an odd name, I know. All I can say is that it’s part of my postal address in Dublin, Ireland, and seemed to be a good idea for an account name when I signed up for Google, Twitter, and so on at the dawn of the cloud Internet era.